BOWIE,Md. (WUSA9) -- Prince George's Fire Department said a driver was trapped in the wreckage of an overturned tanker in Bowie, Md. early Monday evening. Authorities said the tanker was on Route 50 near Enterprise Rd., Bowie. The driver was trapped and extricated with serious, not life-threatening injuries. The tanker was going westbound, ran into the jersey wall and flipped over into the eastbound lanes. At one point all lanes were closed on Route 50. Lanes will be reopened Monday night and the tanker will be moved. BOWIE, Md. (WUSA9) -- Crews responded to a house fire on 12400 Melody Turn in Bowie, Md. Sunday afternoon, Prince George's County Fire/EMS Department said. Authorities said everybody has been accounted for. Firefighters were evacuated from the house to fight the fire from the outside. They were able to get the fire under control. BOWIE, Md. 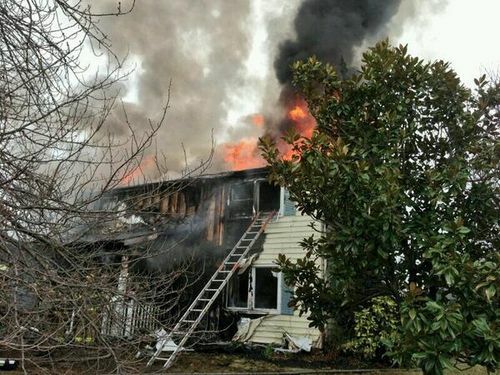 (WUSA9) -- In Bowie, Maryland, the wind was so intense, firefighters could barely get a handle on a house fire on Thursday. Crews responded to a house fire in the 12500 block of Guinevere Road. Officials say the fire spread and quickly engulfed the two-story home, causing a portion of the second floor to collapse. The residents who lived there got out okay. There is significant damage to the house. Crews are still trying to figure out what sparked the blaze. BOWIE, Md. (WUSA9) -- A 62-year-old woman in Bowie Maryland died today after shoveling snow, likely due to complications from a heart attack. Tragedies like this one are an unfortunate and a reminder that shoveling snow can be dangerous, especially for those with pre-existing health conditions, the elderly or those with a disability. If you do have to shovel snow yourself, firefighters and paramedics offer some advice. "Stay away from caffeine, alcohol, take lots of breaks, and stay hydrated," says captain Jason Wisman with prince George's County Fire Department. Shoveling heavy snow like today's can weigh up to 45 pounds at times. "You are using more muscles than you usually would, it's going to be tough," says Wisman. You have to take frequent breaks. PRINCE GEORGE COUNTY, Md. (WUSA9) -- Detectives are trying to find two suspects involved in an armed robbery at a liquor store on February 17. Robbery detectives from the Prince George's County Police Department said the robbery happened at a liquor store on Old Annapolis Road, where they forced an employee to empty the cash register and then fled the store. Authorities believe these two suspects are linked to at least two other robberies at gas stations in Bowie. One robbery happened on February 18 and the second happened on February 22, according to authorities. The suspects fled the gas station on a black motorcycle one time. If you recognize these two suspects in this video, please call the robbery unit at 301-772-4905. SEVERN, Md. (WUSA9) -- Two people were arrested after stealing two puppies from a home in Anne Arundel County on Friday, police said. Ashley Thomas, 21, and Tennese Koffa, 22, both of Severn, Md., stole two blue pit-bull puppies from a home on Patuxent Road, police said. The puppies' owner told police Thomas and Koffa came to the home and inquired about buying the dogs from him. "On February 6, 2014, the victim discovered the puppies were missing from his property. On February 7, 2014, the investigation led officers to the 8200 block of Dunfield Court in Severn where the puppies were safely located," police said in a news release. Police believe there may have been a third person involved in the thefts. Charges are pending against that third suspect, police said.